I have had several requests for an art smock tutorial. And the timing was perfect…..since we needed one in our home. My little girl really loves to paint. Okay, and make a big fat mess. But it’s one of those times that if her clothes are covered…….I don’t mind. Have at it sista!! But she hasn’t had clothing protection until now. Her own little art smock. And just the perfect size. Keep in mind that you can create whatever size you’d like. Even one for you. However, the dimensions given were created for an almost 3 year old. Begin by cutting out your large piece of fabric. Find the center of the fabric by measuring and then trace a large circle right into the center. I used the mouth of a large cup and then added about 1/4 inch to that all the way around. Cut the circle out and then cut a line down one end of the fabric…..starting at the center of the circle and then cutting down the center of the fabric all the way to the end. Then, sew that opening closed again, starting at the bottom…….and then stopping about 8 inches from the circle. Use a 1/2 inch seam allowance. Then roll under those raw edges a 1/4 inch fold and then andother 1/4 inch fold. Then sew into place. Then make another seam along that first seam towards the bottom, just to reinforce it. Now, turn over the fabric and make a few stitches and backstitches right under the end of the opening. Just to keep it strong and from ripping open from beiing pulled on by a toddler. Then sew a basting stitch (really long stitch) along the raw edges, really close to the edge….making sure to never go off the edge of the fabric. And make sure to leave long thread tails. Then pull one of the top threads and start gathering your fabric. Then pin it along one of the 15 inch sides of your rectangle. Then lay it on top of the front side of the art smock, matching up the bottom corners and sides. Then sew the bias tape along the bottom front and back….and then along the sides. Now, attach some bias tape around the neck, sewing slowly as you curve it around the circle. Then sew a seam right down the center of the pocket…..turning that one big pocket into two. Make sure to backstitch several times at the top and the bottom of that seam. Now, using your wide piece of ribbon and your velcro…..attach it to the back of the kneck to create a closure. And finally, attach your thin ribbon pieces (about 13 inches each) to the waist area of the smock. I placed mine about 9 inches down from the center of the kneck hole. And that’s it. You’re ready to give your little one freedom to express their creativity. so cute! I am going to start to need a couple of these now that my youngsters are getting older! love it! And you made it looks so easy! Thank you for the tutorial! So so cute! I bet my 3 year old would love it if I make her one! sooo cute! I love it. 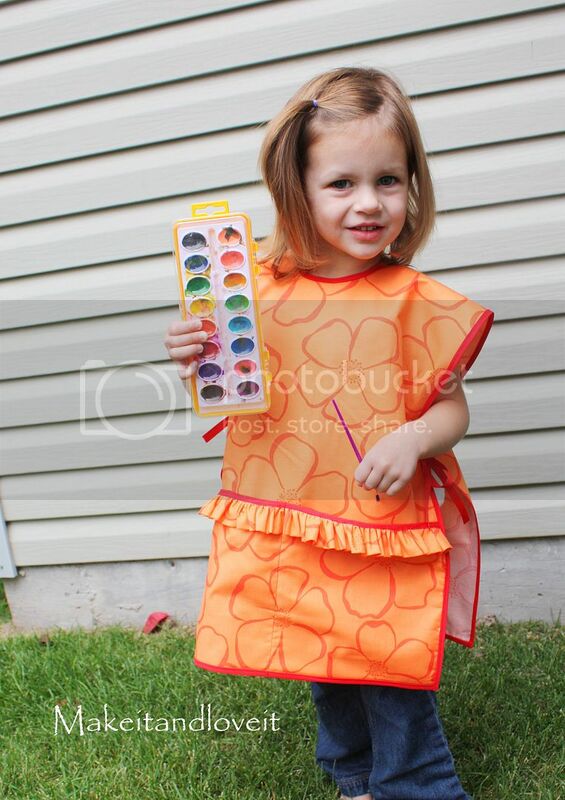 My little one just uses a canvas apron for painting but one of these would be soo nice. Thanks for the tutorial! Oops, I hit post too soon on my last post! Anyway, that is such a darling smock! It looks like I'm going to have to do 3 of these, with one minus the ruffles for my son. :) My kids know how to make a mess! That is just darling! I could totally see one of these made out of one of those vinyl tablecloths too with the soft backing! Then wipe up would be a sinch! Great idea! Super cute! I love this little smock! cute!!! this would be great for my preschool co-op!!! This is so awesome! Thanks for the tutorial! So cute! Thanks for the tutorial!! I will definately add it to my list of projects!! I think this is going to be another mom's group project! You are awesome and I can't tell you how much I love your blog! And thanks for the help on the smurf hat! Thanks so much for the tutorial! I can't wait to try it out this week! I got some oil cloth on etsy last week that I want to use for this & spat mat too – that way they match. It was pretty cheap – $7.50/yard & cheaper shipping than most online stores too. Just search Oilcloth or laminated cotton under "supplies" instead of "handmade"
They had these at the Children's museum in San Jose when we were there this summer for an internship, (but not as cute for sure) and I have been looking for a cute one ever since. This will be great for all the wintertime crafts that will be starting soon. Thanks for humoring me an being nice at the craft store today, I didn't mean to come off too stalker-like :) I was just so excited and all my friends are now SUPER jealous! thank you – great tutorial. it´s sooo lovely! thank you. i've been following your blog for a while and have made several of your projects. YOU ARE SO CRAFTY! I love it. I was wondering…do you have any great ideas or tutorials for a barber smock…the kind of thing to put on my kids when Im cutting their hair so hair doesn't get all over their neck, back, and clothes??? That's is adorable!!! Right now my son just uses one of my old aprons, but this would be awesome! Could you put something on the fabric to keep it from getting stained like Modge Podge or something? Just a thought. You continue to amaze me. I'm trying to think of more ideas for my knitting blog but I don't have a ton of extra time. Good luck with your move. this is EXACTLY What I have been looking for. Thanks so much I can't wait to make this! And again miss Ashley! I didn't know whether to cut a trash bag or not but you have found exactly what I need! I can't wait! So adorable! I can't wait for my daughter (still baking in the tummy oven) to get big enough for stuff like this! I have a feeling she will have plenty of these before she is even walking. haha. How darling! You are so creative! I just followed your tutorial and made the smock for my niece for her birthday. It came out so cute and was very easy to make! Thank you! My wife is a pre-school teacher and she asked me to make smocks for the kids (yes I sew) your pattern and instructions are great. Thanks so much for having someting that looks good and is practical. I just made this using some iron-on vinyl from Joanns. It turned out really well! I'm so excited for Play-Doh to be more fun and less mess. Thanks for the great tutorial. This is very cute! What would you say the measurements would be if I were to make them for ages 5 or 6. They would be for my kindergarten class. I made one for my older daughter and a couple for birthday presents. I used the iron-on vinyl that you used in another tutorial (I had never heard of it before, and now I think it is so great!) and they come out so cute. With the iron-on vinyl, the ruffle is a bit harder to do. I hand stitch a very long stitch length through it and then gather it up that way. When I tried it on the machine, the thread would break when I tried to gather it up. Ashley, your tutorial is adorable! Just wanted to let you know I added this link to my website as part of my Back to School theme. Thank you for such a great tutorial! 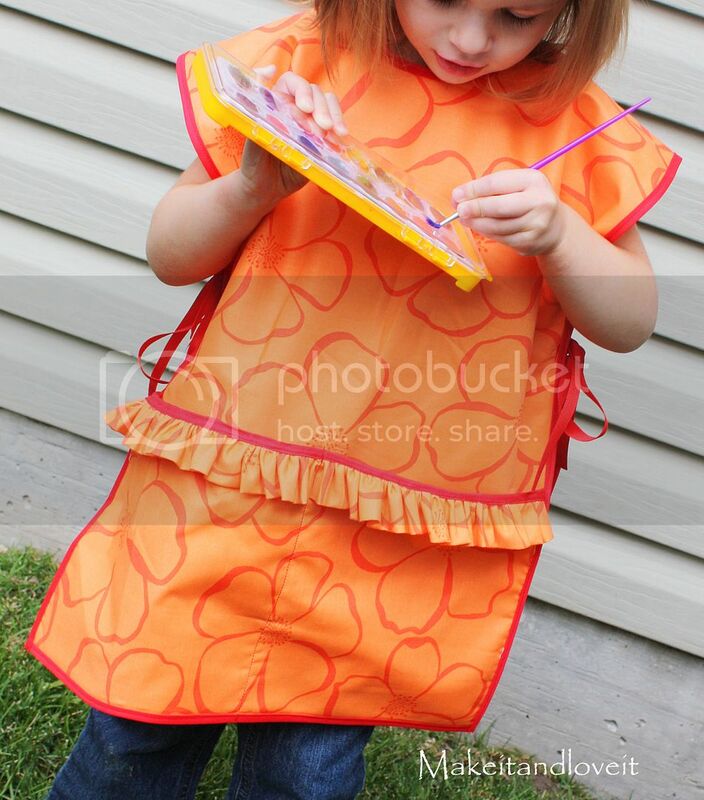 I used it to make my niece an adorable new art smock to start off her year in kindergarten. You can see it on my blog where I also mentioned your tutorial. Thanks again! Thanks so much for the steps, I was looking for a smock exactly like this one.